Had a wonderful lunch today with some coworkers who threw me a mini shower. We had lunch at a new pizza place called Pizza Cucinova. It is set up just like a Chipotle or Piada except you order pizza and salads instead of burritos or wraps. It was very tasty. They had a bunch of yummy cheeses (that I can’t have), so we will have to go back when I can be more adventurous. 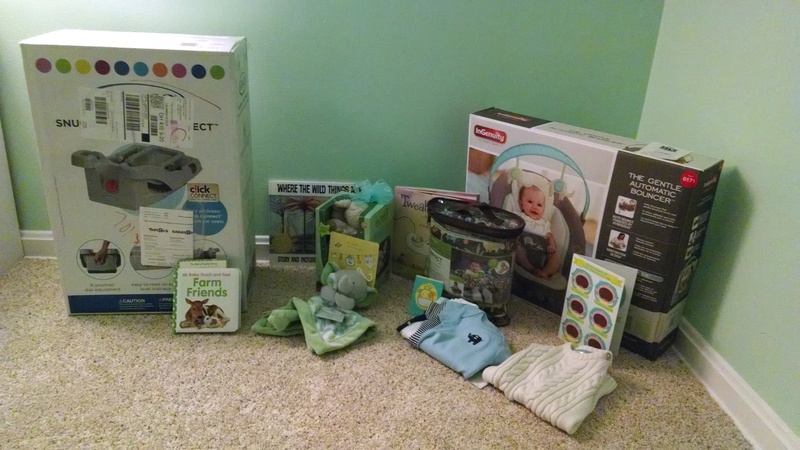 Everyone was very generous, and the baby received some great gifts! Of course they are already in the nursery ready to be put away :). The baby now has a good start to his library along with some cute clothes. Thanks again ladies! The baby was really moving around today. 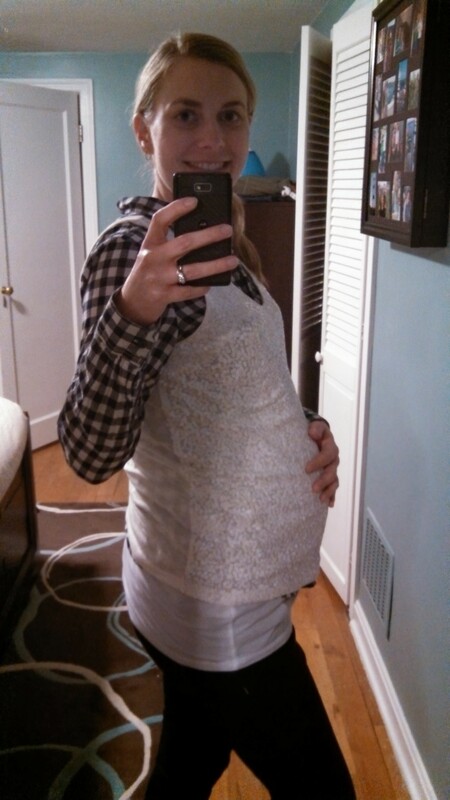 At one point tonight my stomach changed shape while he was moving around trying to get comfortable. I have to say it was a little painful until he stopped moving. Maybe soon we will be able to see the outline of his hand or foot. We’ll just have to wait and see. 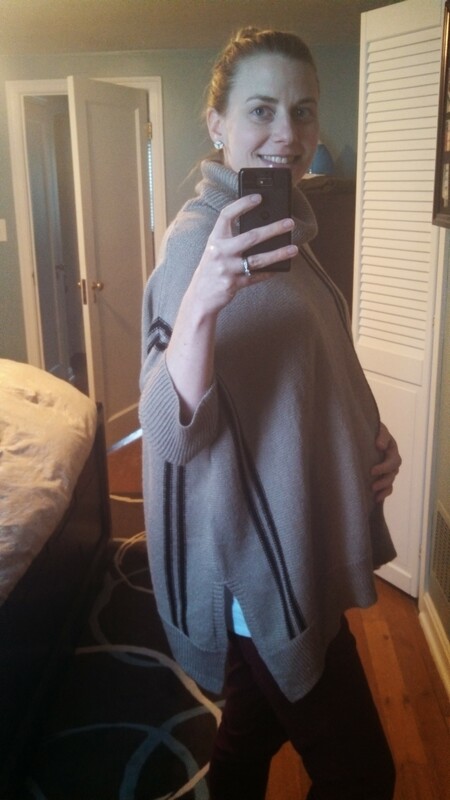 It is getting harder to find clothes that fit the bump. As I sit here relaxing on our new glider and ottoman in the nursery I can’t believe that in 2 short months we will be welcoming a baby boy into our lives. 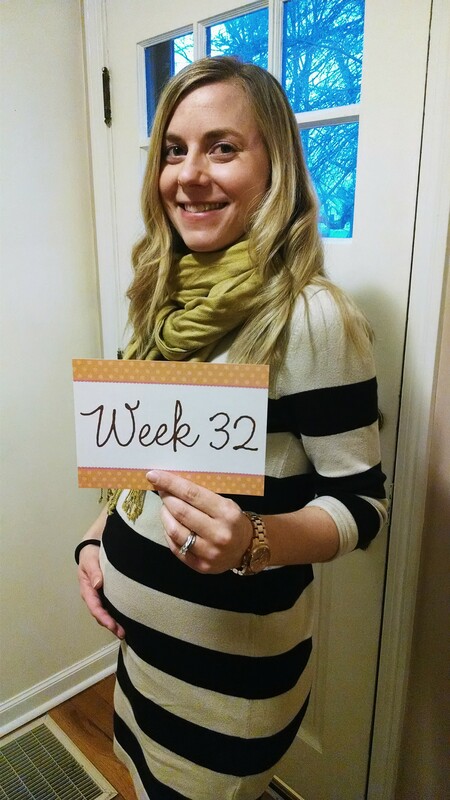 We still have some things to do to prepare for his big arrival, but we are getting close. We were able to get the closet pretty much put together this weekend. It only consists of a tension rod attached to a dresser with a few bins for storage. I don’t think (at least for a year or so) he will need to have much hanging, and he will have plenty of drawer space for his tiny adorable onesies :). We also got a cube shelving set to use for random toys and books. The one thing that is looking bare in the nursery are the walls. 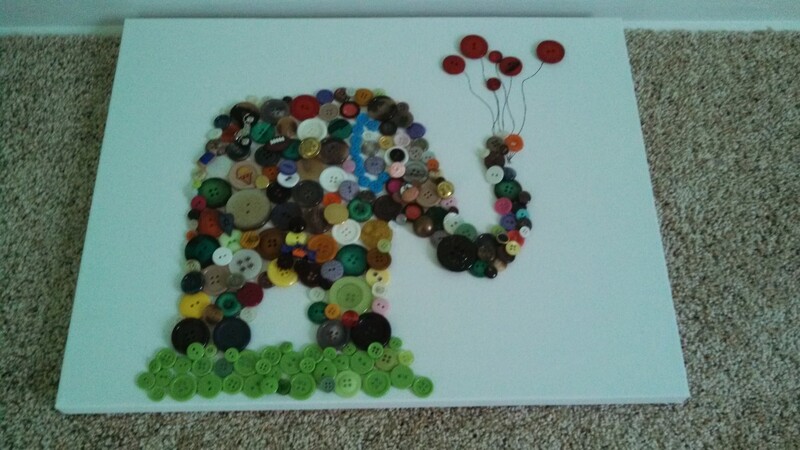 When we were in Virginia a few weeks ago I saw this adorable button elephant on a piece of canvas. I was about to buy it for the nursery but then I saw the price. Tony suggested that I make one. So that is what I did this weekend. It took a while to make, but I have to say it turned out pretty well and I enjoyed putting it all together. Now to think of some other crafty things that I can do to fill up the space on the walls. On another note, if there are any moms reading my blog let me know what was helpful in your hospital bag. I want to have it together by the end of next month just to put my mind a ease. Good news first. 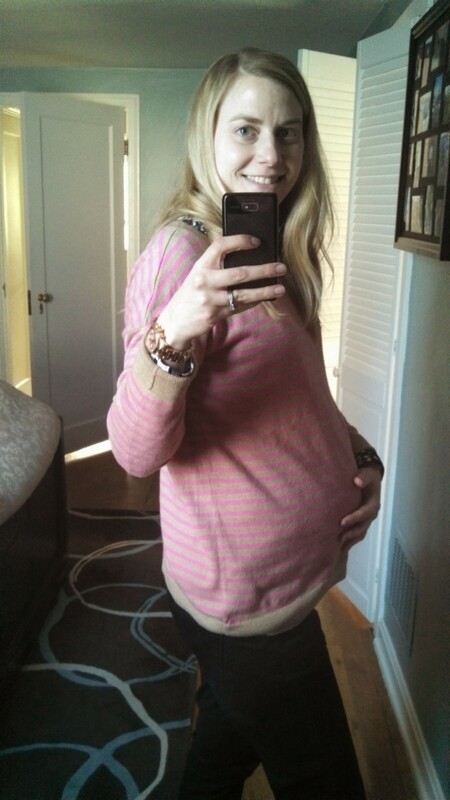 Baby is doing great and is growing as he should be at 31 weeks. At some points in the day I think he is doing somersaults. So much so that I can see my stomach getting pushed up by him. I am really glad that he is healthy, and I am starting to get anxious to meet him. As for me, I am becoming very clumsy these days. After a wonderful weekend that included a surprise prenatal massage and macaroons I accidentally missed the last step going down the stairs Monday morning, and most likely broke my toe. It is very black and blue, and it really hurts to walk on. I have been limping around the office during the day, and icing it at night. I hope it heals up soon so I can get back to yoga some day. A few posts back I put some inspiration on what might be a good idea to put in the hospital bag, and I have started a small pile in the nursery. So far I have a robe, a 3 piece pajama set, comfy sleeping bra, nursing tank, and a loose nursing shirt. I think it is a good start for now, but I still need to get fitted for a nursing bra. 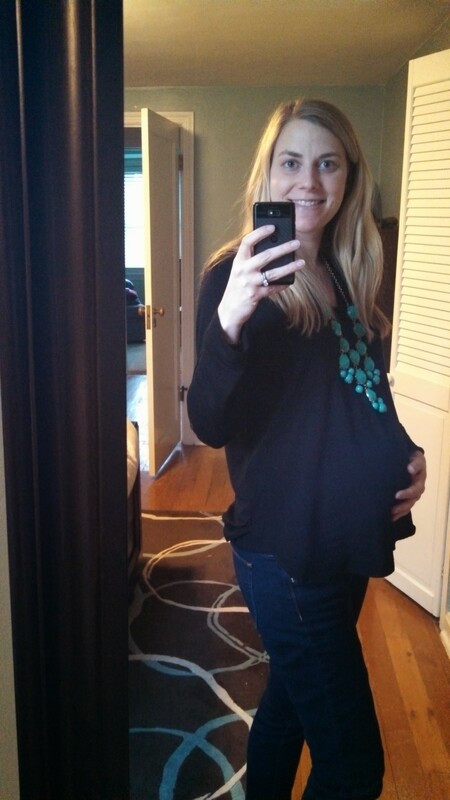 I learned from the breastfeeding class last night that you should wait until 37 weeks to be sized. Speaking of baby classes, we have completed 2 out of the 3 so far. We went to the Baby Care Basics class last weekend, and the Breastfeeding class last night. Both classes were good, and we learned a few things. I just wish there were more hands on learning rather than just power point presentations. Hopefully the birthing class will put me more at ease. It’s been a while since I have had the time to post anything. We have been really busy with work, and we were out of town last weekend. We took a trip to visit my sister-in-law and her boyfriend in Virginia. It was nice to spend some time with them, and check out the city of Richmond. While in VA we went to a few different shopping centers and ate at a really delicious French bistro for breakfast. 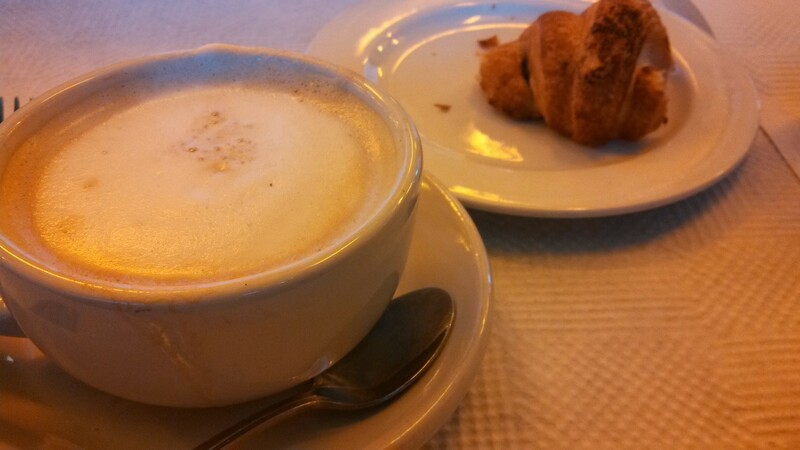 I was able to get a big chocolate croissant and latte – and that was just the appetizer to my breakfast. Can you tell that I am very pregnant and food is a huge part of my life right now? :). Here is a picture of part of my breakfast. Last night we went to a surprise 30th birthday party for a friend. 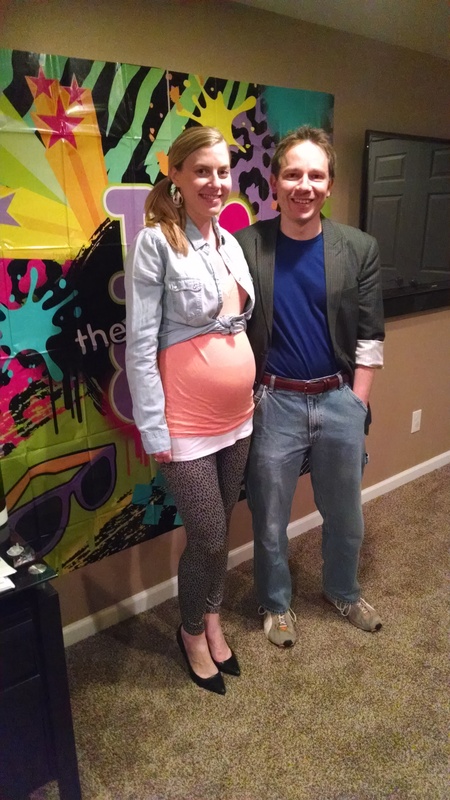 The party had an 80’s theme, and we dressed the part. I was a little skeptical that I would be able to find anything that would fit, but then I found this awesome pair of animal print leggings at Target. The party was a success, and everyone looked great. 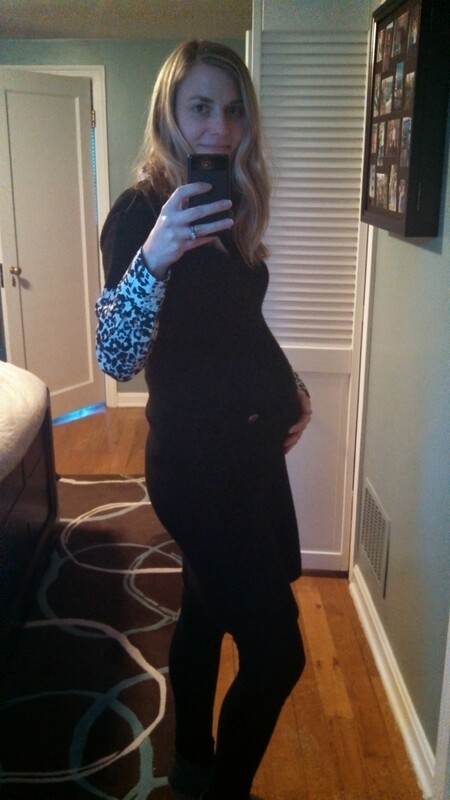 I am getting very excited to celebrate with friends at my shower in a few weeks. Just tonight I went to a co-workers shower who is due a few weeks before me (also having a boy), and she got some cute things. The room at the restaurant was decorated with monkey decor, and after dinner we had yummy cupcakes. 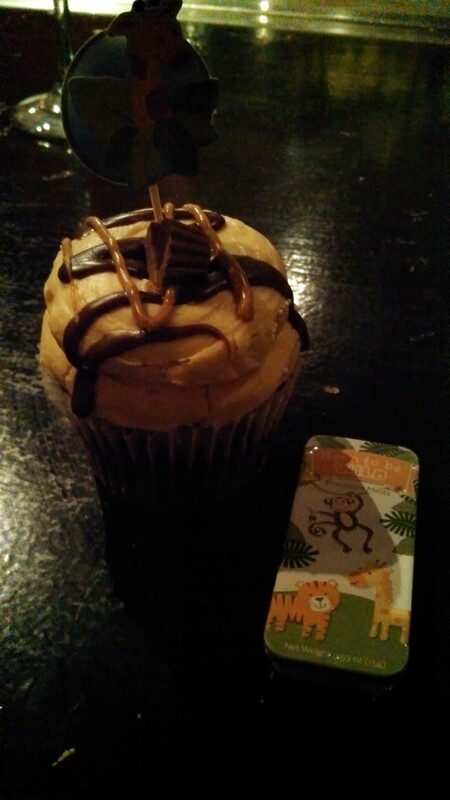 Here is a picture of the cupcake along with monkey mints for the favors. Well I think that’s all for now. The nursery is really coming together. I will take some pictures once we have things where we want them. Have a happy Valentines Day! I can’t believe it’s already Sunday night. It has been a crazy few weeks at work, and it is about to get crazier this week. I am really going to try and focus on not getting too stressed out for the baby’s sake, and try to focus on what is really important – this little baby in my belly. He has been kicking away, and based on our appointment this week past week he seems to be growing well too. I am at the point now where we will be seeing the doctor every 2 weeks. It’s amazing how fast the time is going. Before we know it he will be here. My goals for this month are to get a hospital bag started, start looking for what I want to have on the walls, get the closet planned out, and get the furniture back in the room. Lots to do, but such an exciting time. I have been slacking at taking pictures this week. This is the only one that I took. I will try and be better about it this coming week. Thank goodness for sweater dresses!